Now it’s easier than ever to give songbirds just what they need: fresh food from a clean, hygienic feeder. Droll Yankees' new Ring Pull bird feeders can be completely disassembled, without tools, in just seconds for thorough cleaning, and can be reassembled just as easily. 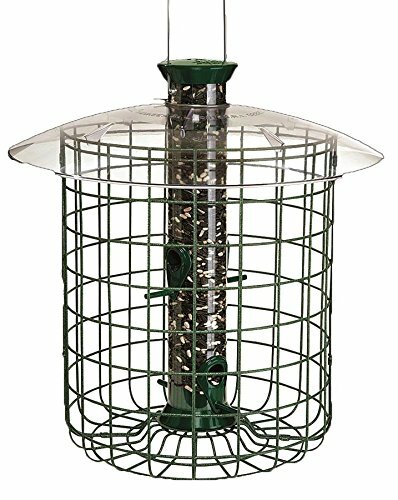 These newest Droll Yankees bird feeders express the state of the art in bird feeders while delivering superior quality and ease of use. 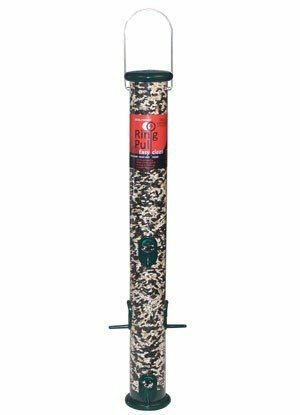 The Ring Pull feeders address the importance of keeping bird feeders clean by using a vertical rod to hold the ports and base in place. Simply pull the central rod and the ports and base tumble away from the feed tube. This ground breaking feature takes the ease of cleaning bird feeders to a whole new level. This feeder is 23-inches tall; has forest green perches, cap, and base; has six feeding ports; and holds 1-1/2-pounds of sunflower or mixed seed. Openings for nyjer seed are designed to dispense seed economically.. Top assembly easily removed for cleaning.. Seeds ports are designed to keep seed within reach.. The metal parts are squirrel resistant. The weight and design of the metal cap makes it difficult for predators to lift.. . 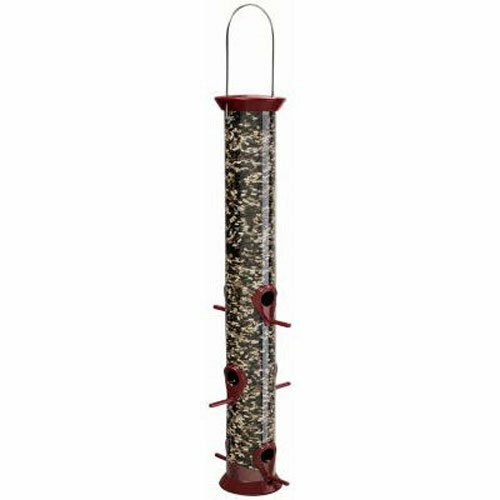 The feeder can be hung or pole mounted. Holds 1 pound. Length 15 diameter 2.5 capacity 1pound 6 ports. Aluminum perches can not be chewed. CJM23G Color: Forest Green, Size: 23" Features: -New Generation collection. -Won't chip or fade. -Zinc die cast tops, bases and ports - to last a lifetime. -Stainless steel wire. Orientation: -Hanging. Feeder Type: -Nyjer/Thistle. Squirrel Proof: -Yes. Color:Dimensions: Size 15" - Overall Width - Side to Side: -5.5 Inches. Size 15" - Overall Depth - Front to Back: -5.5 Inches. Size 15" - Overall Height - Top to Bottom: -19 Inches. Size 15" - Overall Product Weight: -1.5 Pounds. Size 23" - Overall Width - Side to Side: -5.5 Inches. Size 23" - Overall Depth - Front to Back: -5.5 Inches. Size 23" - Overall Height - Top to Bottom: -27 Inches. Size 23" - Overall Product Weight: -1.5 Pounds. Size 8" - Overall Width - Side to Side: -5.5 Inches. Size 8" - Overall Depth - Front to Back: -5.5 Inches. Size 8" - Overall Height - Top to Bottom: -12 Inches. Size 8" - Overall Product Weight: -1.5 Pounds. 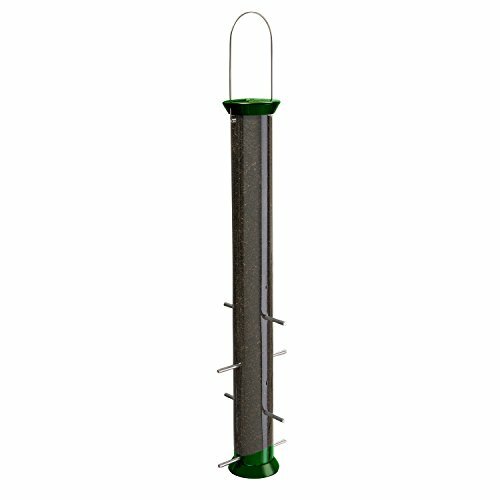 Sunflower Feeder 23 in., Green. Zinc die cast tops, bases and ports- to last a lifetime Stainless steel wire- squirrels can't chew Snug fitting sliding cap- easy for you to lift but hard for squirrels Top assembly- easily removed for cleaning Contoured base- keeps seed within reach. RPS23G Color: Green, Size: 27.5" H x 5.5" W x 5.5" D Features: -UV stabilized polycarbonate tube. -4 Ports and 1 pound seed capacity. -Easy cleaning ring pull advantage. -No tools needed, just pull the metal rod and the ports and base fall away. -6 Ports and 1.5 pound seed capacity. -Made in the USA. Orientation: -Hanging. Easy Refill Top: -Yes. Country of Manufacture: -United States. 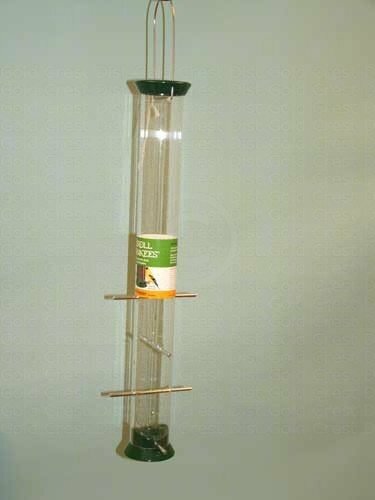 Feeder Type: -Tube. Size 20" H x 5.5" W x 5.5" D - Seed Capacity: -1 Pounds. Size 27.5" H x 5.5" W x 5.5" D - Seed Capacity: -1.5 Pounds. Dimensions: Size 20" H x 5.5" W x 5.5" D - Overall Height - Top to Bottom: -20". Size 20" H x 5.5" W x 5.5" D - Overall Width - Side to Side: -5.5". Size 20" H x 5.5" W x 5.5" D - Overall Depth - Front to Back: -5.5". Size 27.5" H x 5.5" W x 5.5" D - Overall Height - Top to Bottom: -27.5". Size 27.5" H x 5.5" W x 5.5" D - Overall Width - Side to Side: -5.5". Size 27.5" H x 5.5" W x 5.5" D - Overall Depth - Front to Back: -5.5". Compare prices on Droll Yankee 23 Green at Elevelist.com – use promo codes and coupons for best offers and deals. We work hard to get you amazing deals and collect all avail hot offers online and represent it in one place for the customers. Now our visitors can leverage benefits of big brands and heavy discounts available for that day and for famous brands.